Words of wisdom: because Prentice's dad is a hell of a lot smarter than mine is. "Telling us straight, or through his stories, my father taught us that there was, generally, a fire at the core of things, and that change was the only constant, and that we - like everybody else - were both the most important people in the universe, and utterly without significance, depending, and that individuals mattered before their institutions, and that people were people, much the same everywhere, and when they appeared to do things that were stupid or evil, often you hadn't been told the whole story, but that sometimes people did behave badly, usually because some idea had taken hold of them and given them an excuse to regard other people as expendable (or bad), and that was part of who we were too, as a species, and it wasn't always possible to know that you were right and they were wrong, but the important thing was to keep trying to find out, and always to face the truth. Because truth mattered." 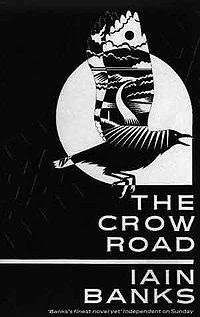 From Iain Banks, 'The Crow Road' (thanks Chris). What's the best piece of advice that's been handed down to you? With every good bye you learn." I like this exerpt- thinking of adding the book to my 'to-reads' list. The thing about this is that the punctuation drives me crazy! I like what's he is saying though.